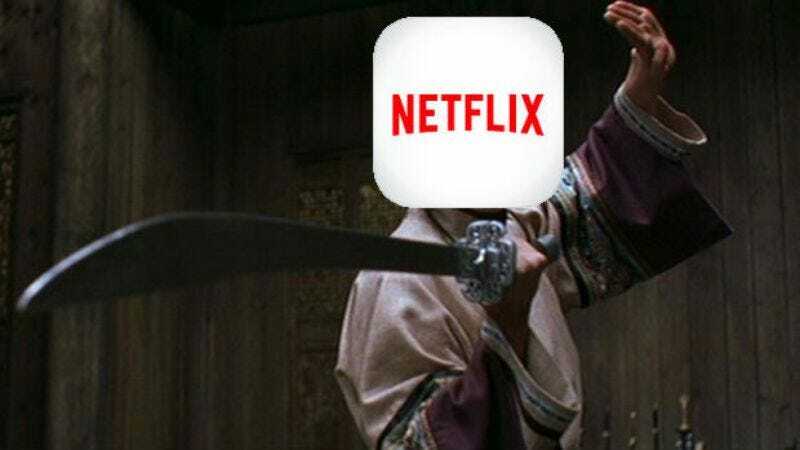 TV shows and documentaries have been premiering first on Netflix for a while now—just as certain movies have been available from On Demand services on the same day they arrive in theaters—but Crouching Tiger, Hidden Dragon: The Green Legend will be the first major film to be available only on Netflix and in select IMAX theaters at the same time. That means it’s skipping boring regular theaters entirely, and the only ways to see it when it’s released next year will be on IMAX or on any of the million devices that can access Netflix. We guess you could take your iPad into a theater and watch it there, but that might annoy the people who are sitting around you. Anyway, Crouching Tiger, Hidden Dragon: The Green Legend is filming right now, and it stars Michelle Yeoh as Yu Shu-Lien—the character she played in the original—alongside appearances from Glee’s Harry Shum Jr. and Ip Man’s Donnie Yen. Yuen Woo-Ping, the guy who choreographed the first movie’s crazy fight scenes, will take over for Ang Lee as the director. Crouching Tiger V. Hidden Dragon: Dawn Of Green Legend will be available to stream on August 28, 2015. Also, it’s a safe bet that every movie theater in the world will go out of business that day.